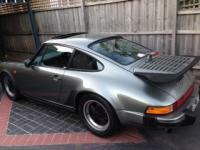 So up against this $250k 3.2 is the 968 clubsport listed at $125k now great value?? Only $10k??? add $20k me thinks! As a current owner of both a Carrera 3.2 and a standard 968 manual coupe...I can confidently say both are very different cars but at the same time still feel distinctly....old school Porsche!!! The biggest difference to me is that the 968 is much more user friendly at lower speeds, daily driving and more forgiving at the limit. The 968 makes me look like a decent driver in the twisties....the 3.2 on the other hand, feels like a old school muscle car in comparison, and much more rewarding at the limit ...if you get it right! The 968 is a very underrated car....6 speed manual, ABS, nicely weighted power steering (like a 964), variocam, 240hp...it’s a great overall package, and practical!! If I could only have one it would be the 3.2...cause it’s the classic Porsche I always dreamed about... If it was about value for money (disregard this $120k CS) and it was to be manual coupe, a 968 is hard to beat. Not many around which is also a bonus. And did I mention they look horn!!!! This is a very sweet SC....done perfectly! good luck with the sale ....what’s next? Something Italian?? Please don’t be a troll!! I hope it’s the real Jerry!!! Any sales regarding 16” replicas to suit a G Series?? Good to see what it’s been serviced regularly!!? Definitely genuine?? Do you have pics of the 16x8’s?? Are they date stamped? Two very sweet 930 turbo builds....still aircooled!